WordPress Prevent Direct Access to Media 3.0 Has Arrived! WordPress Prevent Direct Access to Media 3.0 Has Arrived! While Prevent Direct Access Gold version 2.0 is a complete change for the better and could be considered a success, our team knows we need to continue reinventing ourselves and WordPress Prevent Direct Access to Media. The new version would not be about minor updates nor incremental improvements. It must be a game changer for both our plugin and beloved customers. Roughly 2 months ago we started the development of Prevent Direct Access Gold 3.0 with new ideas and a huge commitment. The past 60 days were long to some of us but the new logic and features were just too exciting for us to take a rest. We wanted to take Prevent Direct Access Gold to the next level and couldn’t wait until its release date. Well, the wait is now over! Prevent Direct Access Gold 3.0 has finally arrived and let me tell you, it’s awesome! The performance is hugely improved while the User Interface (UI) is simpler and more intuitive. As a result, the User Experience (UX) is much better as well. The new logic, features, and UI take everything you love about Prevent Direct Access Gold and makes it infinitely better. We’re so excited to show you our Prevent Direct Access Gold 3.0. There are a lot of major changes in terms of both logic and UI that we’ve made on this exciting version 3.0. Let’s go through them one by one. First things first, we’ve made a major logic change on how a file is protected. On version 2.0 and below, once you protect a file, a private download link is automatically created for you to access it. In other words, a file is considered “protected” if there is at least one (1) active private link. If you’ve created says five (5) private links for your file but they all expire (reaching click or date limit that you’ve set), that file is considered “unprotected”. On version 3.0, we handle file protection and its private links logic separately. That means you can now protect any files without having to create any single private link. Private download links are now more or less optional. If you decide to unprotect your files, their private links are hidden but not removed from the database. When you protect the same files again, their private links will reappear as per usual. This logic change, plus a few tweaks on htaccess rewrite rules, significantly improve the performance of our Prevent Direct Access Gold and your website’s protected files as a whole. A simplified file protection logic means you can now protect your files instantly and anywhere under Media grid view, “Add Media” while editing posts and pages as well as their own attachment pages, together with the traditional configuration under Media list view. Custom roles which allow you to select multiple user roles such as admins, subscribers, and members at the same time. This change simplifies our setting options and reduces unnecessary confusion previously. We used to have an option that allows all logged-in users to access protected files plus another one called “Block Search Indexing Only”, which basically means your private files are still accessible to “anyone” but search engine bots. That was confusing but is no longer the case now. We also integrate this file access permission into each individual file, that is to say, you can now grant access to a particular document by different user roles from the default settings above. You’ll need Download Link Restriction extension to fully activate all options on each and every file. 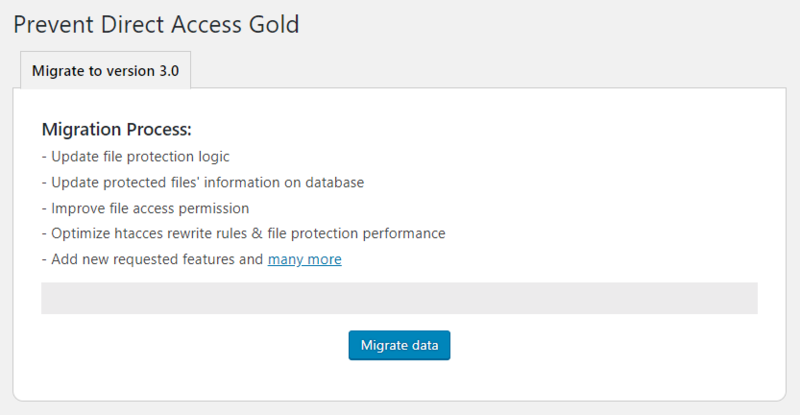 Prevent Direct Access Gold 3.0 now moves all your protected files into a private folder. That means we don’t have to “disallow” each and every original URL of your protected files on the robots.txt anymore. Similarly, instead of telling Google and other search engines not to index your file’s attachment page through your robots.txt, we block search indexing more effectively by including a ‘noindex’ meta tag into the <head> section of your page as recommended by Google. Your robots.txt rules are now much cleaner while your private files’ attachment pages are better protected. We’ve added a new “Protected Files” filter under Media so that you can view all your protected files at a single glance. This is particularly useful if you have a lot of Media files, in which there are a few protected files here and there. It’s painful if not impossible to remember all the protected files and where they are on WordPress Media when you want to say create a new private download link. What’s more, you can now easily recognize which files are being protected by Prevent Direct Access Gold. Protected files are now highlighted by a red shadow under grid view. This comes in handy when you want to make sure your writers and editors don’t accidentally use protected images within a public post. In terms of UI, a placeholder photo will appear in place of “missing” images if they’re protected on your WordPress admin. Likewise, if you accidentally insert your private images into your content, our plugin will replace it with a default image as well. We also improve our plugin’s copy and UI so that its settings are neater and easier to understand. The core of Prevent Direct Access Gold 3.0 is ready and has been released since June followed by a list of new exciting features, which needs just a little extra attention. We want to make sure once a new feature is launched, it’s going to work like a charm! Existing customers need to migrate their file data and settings over for them to work properly on this latest version. Fortunately, the migration process is quite straightforward. After you’ve updated our plugin to version 3.0, just deactivate then activate our plugin again. That’s all. You’re all set. We can’t wait for you try this new exciting version! If you want to see what Prevent Direct Access Gold 3.0 is all about, then we highly recommend you to take a look at all of its new features now. 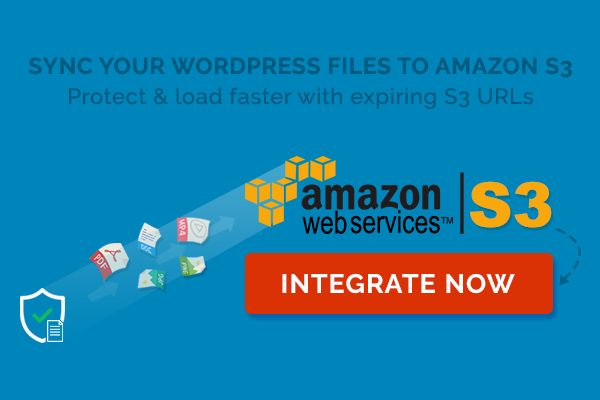 WordPress prevent direct access to media files is never easier with our Gold 3.0.